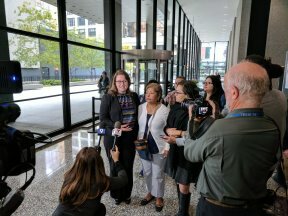 “Abuelita” Genoveva Ramirez appeared at her first court hearing on Tuesday morning at Dirksen Federal Building following the lawsuit she has brought against the Department of Homeland Security earlier this month. Ramirez received good news at the court hearing, representatives of U.S. Citizenship and Immigration Services (USCIS) indicated that they will begin to take steps to make a preliminary decision on Ramirez’s U-Visa case. Ramirez hopes that a favorable determination from USCIS will compel ICE to postpone her deportation. Genoveva Ramirez is a 67-year-old grandmother and great-grandmother of nine, originally from Mexico, who has lived in the United States for nearly two decades. She filed a U-visa application in September 2016 after she and her grandson were physically assaulted during a home invasion and she subsequently assisted in the police investigation. The U-visa is a form of immigration protection available to victims and witnesses of certain crimes who then cooperate in the investigation or prosecution. Although a U-Visa would eventually place Ramirez on a pathway towards citizenship, delays in the USCIS adjudication process have caused U-visa applicants to wait as much as three years for decisions on their applications. In August ICE did not grant preference to stop Ramirez’s deportation. In response, Ramirez filed a lawsuit against the Department of Homeland Security to demand USCIS review her long-pending visa application before ICE seeks to deport her. In her lawsuit, Ramirez asked the U.S. District Court of the Norther District of Illinois Court to order USCIS to either make an initial determination that she is eligible for a U-visa or have ICE arbitrate her application so she is able to stay in the United States. “I am excited to hear that my next check-in has been pushed back to January. The news will allow me and my family, my grandchildren included, to all sleep a little better these next couple of months. It also re-affirms my belief in the power of our community. I know that ICE is responding to the tremendous pressure which community has applied. However, until USCIS grants me a U-Visa, I know that this is far from over. 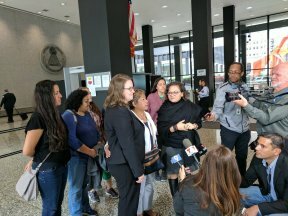 I am going to continue to move forward with my lawsuit and am asking for community members to please continue to support and to remember that organizing works,” said Ramirez following Tuesday’s court hearing. Ramirez’s next court date in federal court is scheduled for November 6, 2017. Ramirez’s family and supporters, members of Organized Communities Against Deportations, PASO-West Suburban Action Project, National Immigrant Justice Center, Service Employee International Union: Local 1, and other community groups attended the court hearing to show their support.